Three breakfast recipes to get you excited about organic. With the kids back at school, your weekday mornings just got even more hectic. That’s why September is the perfect month to rethink your breakfast routine. After all, it is the most important meal of the day. This September marks Canada’s seventh annual Organic Week, the largest celebration of organic food, farming and products across the country—and there’s plenty to be excited about. Choosing organic foods and products benefits not only you and your family, but the world around you since you’ll be investing in your health, supporting environmental sustainability and promoting animal welfare. In celebration of organic, the Canadian Health Food Association (CHFA) has developed three simple, nutritious breakfast recipes highlighting organic ingredients to encourage Canadians to think outside the cereal box and take advantage of the health benefits of organic foods. First up is the underrated carrot. Carrots are rich in carotenoids, a category of phytonutrients with important health benefits, including helping to decrease the risk of certain cancers and potential vision loss. Since humans are unable to synthesize carotenoids naturally, it is necessary to obtain them through diet. 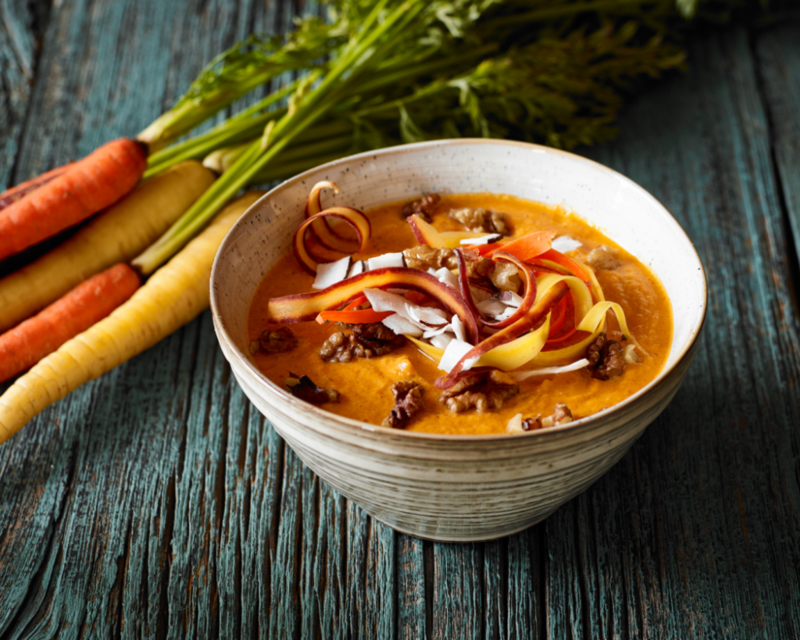 Carrots are an essential ingredient in this breakfast smoothie bowl, reminiscent of the beloved dessert. *Place 1/2 cup rinsed cashews in a bowl with 1 cup of filtered water. Let soak from two hours to overnight. **To make carrot ribbons, run a peeler along the length of a carrot. Combine all ingredients in a high speed blender and blend until smooth. Spoon into bowls and serve with toppings. 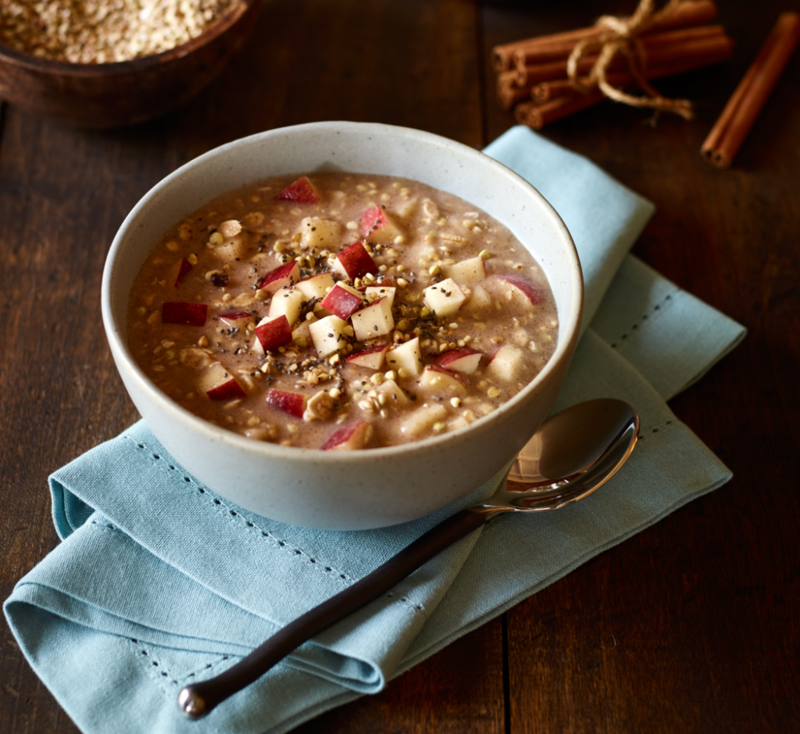 Next up, CHFA has put a new spin on overnight oats, pairing apples with the lesser-known but nutrient-dense buckwheat groats. Buckwheat groats are the hulled seeds of the buckwheat plant and make a great substitute for people looking to avoid gluten. They also contain high amounts of minerals and antioxidants and help to control blood sugar, adding a healthy punch to your first meal of the day. You can make this recipe in just 10 minutes at night, making it perfect for busy families looking for healthy meals on the go. Place all ingredients in a large one litre mason or canning jar. Shake to combine and refrigerate overnight. Serve topped with your choice of garnish. Apples came second on the Environmental Working Group’s (EWG) Dirty Dozen list, so be sure to always choose organic apples and eliminate the risk of consuming potentially harmful residues. 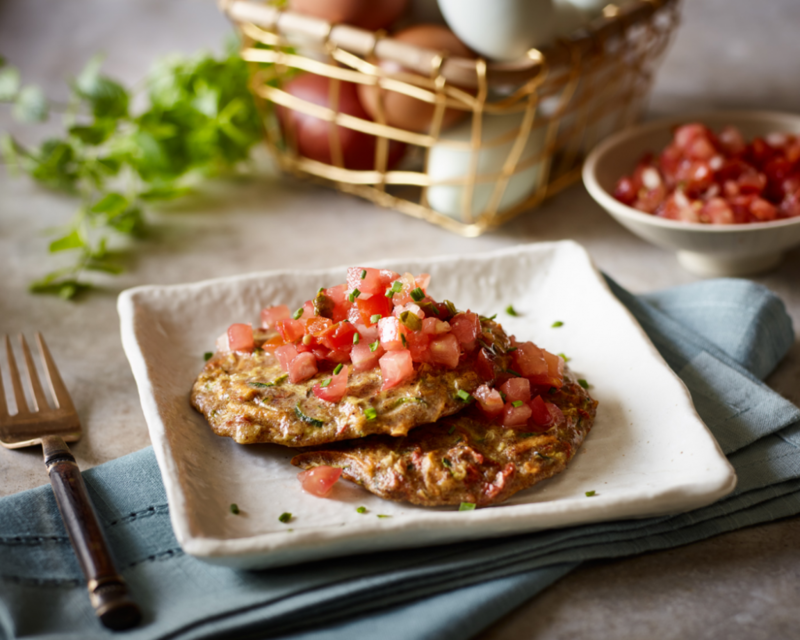 Last but not least, CHFA has appealed to pancake lovers with a nutritious option that boasts a savoury twist and is packed with protein, fibre and omega-3 fatty acids. Starting your morning with this healthy and delicious option provides the energy needed to tackle a busy day. Best of all, the pancakes can be frozen for up to two weeks and are a snap to reheat in the toaster or microwave. *Combine the 1/2 cup sundried tomatoes with 1 1/2 cups water. Soak for one to eight hours. Place all ingredients in a large bowl and stir to combine. Dollop 1/4 cup portions of mix onto a large parchment-lined baking sheet and spread into three-inch circles, spaced one inch apart. Bake at 375°F for 15 minutes or until bottoms are light golden brown. Let cool completely and layer with wax paper in between each pancake. Freeze in an airtight container for up to two weeks. Reheat pancakes in a toaster or microwave. Serve with fresh salsa, hot sauce, hummus or avocado slices. You can also cook these savoury delights in a cast iron skillet. Just reduce the cooking time by five minutes and make sure you add a little oil to the skillet before pouring in the pancake mixture. Visit your local health food stores and farmers’ markets to discover these and other organic ingredients. 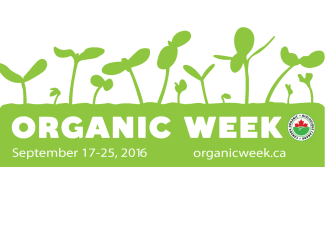 Organic Week is organized by the Canadian Health Food Association, Canadian Organic Growers and the Canada Organic Trade Association. For more recipes and information about Organic Week, visit chfa.ca. The Canadian Health Food Association (CHFA) is Canada’s largest trade association dedicated to natural health and organic products. Michelle W. Book is CHFA’s in-house holistic nutritionist.